On August 9, 1862, twenty year old Henry Livermore Abbott suffered a great personal tragedy; the death of his beloved older brother, Ned. Writing to his father weeks later, Abbott admitted, “I have had a good many letters about Ned but I can’t answer them. To think of the subject unmans me. I have to keep it from my thoughts.” He struggled to come to terms with this loss, as this was more than the death of a sibling. It was the loss of a comrade killed in battle. Abbott was trapped between his upper class New England world in which gentleman were to operate within an ideal of emotional control and sentimentality, and his new existence on the ground level of the Army of the Potomac. He was conflicted over how to properly grieve for his brother within the confines of the Victorian culture of death, while still presenting the “coolness” and manliness expected of an officer and a gentleman. This tension initially caused him to suppress his grief for fear of being “unmanned” in front of his fellow soldiers. Eventually, Abbott found a different and more acceptable way to display emotion through mourning the deaths of fellow soldiers in his regiment as surrogates for his brother’s death. Over time, Abbott’s comrades became much more than stand-ins for his family. He truly began to conceive of the men he fought and suffered with from the beginning of the war in brotherly terms, and this allowed him to create a space in which he was comfortable openly grieving. Abbott’s struggle was an example of major challenges the Civil War presented to northern Victorian society in the realms of both grieving and masculinity. Throughout his three years of soldiering, Henry Abbott’s overall views on grief and death, or his ideals concerning manliness, changed very little. The true change occurred in how these ideals were implemented. Through his use of surrogates for both his family and the creation of the “good death,” Abbott was able not only to grieve for his brother, but also come to terms with the stresses the Civil War placed on his ingrained ideological world. By finding avenues through which the implementation of his traditional views on manliness and death could be altered, Abbott was able to salvage his ideological foundations and apply them to a new world of carnage and violence. Henry Abbott, the third of eleven children, was born on July 21, 1842 in Lowell, Massachusetts. His wealthy, politically active family belonged to a segment of Massachusetts society known as the “Boston Aristocracy.” At the age of fourteen, young Henry began his career at Harvard, an institution which at this time was just as concerned with teaching boys how to be gentlemen as it was with providing them with an education. The administration was known to be formal, overbearing, and even puritanical, and Henry, like many of the other students, rebelled. He was consistently rebuked for vices such as “indecorum at prayers” and “tardiness at recitations,” and was twice suspended, but managed to keep up with his studies enough to graduate in the middle of his class in 1860. A brief stint studying law under his father’s tutelage was interrupted with the onset of war and the subsequent call for troops in April of 1861. From the outset of the war, Abbott struggled with perceived ideals of manliness. Two of his brothers almost immediately accepted officer positions with the 2nd Massachusetts, swept up with the patriotic fervor seizing many young men at the time. Abbott was less enthusiastic, admitting in a letter to his father in May of 1861 that his “tastes are not warlike like Ned & Fletcher’s, but literary & domestic.” Despite this view, the 1860s was a time when many varying and sometimes contradictory views on manliness existed, none of which would allow Abbott to remain passive while other men were offering their service to the nation. Abbott and other young men at the time were influenced by the idea of restrained manhood, which emphasized familial ties, the practice of a strong Protestant faith, expertise, and success in business, as well as bravery, moral fortitude, and reliability. An older influence was the idea of “communal manhood,” a concept developed in colonial New England and passed down through the generations. This model dictated that manhood was connected to duties to the community, and the fulfillment of these duties was through public service. For boys coming of age in the antebellum era, the ideas of being a man, a soldier, and a citizen were linked. Another concept which swayed Abbott’s decision to enlist was that of the “self-made man.” Proponents of this idea believed that manhood was based on individual interests, personal achievements, and that the key to this was not to limit passions but channel them appropriately. This idea complimented the search of many young men to become “heroic individuals” during the antebellum era. Abbott expressed some concerns over the idea of personal achievement when he wrote to his mother that he “felt that I had never done any thing or amounted to any thing in the whole course of my existence…And what is more, that seemed to be the opinion of every body else.” He went on to admit his disgust with himself over this matter, and “resolved if I couldn’t do much, to do what so many other young men were doing…” What other young men were “doing” was enlisting in the army to fulfill their duty to community and nation. Abbott’s desire to prove himself as an individual was clear from this admission, and his commitment to this concept of personal success only deepened throughout the course of the war. Initially, Abbott enlisted not with his brothers in the army, but with the Fourth Battalion of Infantry, a citizen’s militia assigned to Fort Independence and tasked with defending Boston Harbor from a possible attack. Abbott quickly grew dissatisfied. As many of his fellow gentlemen left the fort for active duty, among them Abbott’s close friend Oliver Wendell Holmes, Jr., his determination to find a commission in the army grew. Abbott’s father, already having two sons in the army, expressed concern with sending a third, feeling that “two are enough to be shot out of one family.” Josiah Abbott also questioned his second eldest son’s nature, described him as a “mamma’s boy,” and indicated that he might be better off on garrisoning duty than in active service. His father’s derision only strengthened his resolve to find a commission, and on July 10, 1861 Henry Abbott became a second lieutenant in Company I of the 20th Massachusetts Infantry. The 20th Massachusetts eventually became known as the “Harvard Regiment” because of the high number of the unit’s officers that had graduated from the institution. This name was not reflective of the regiment as a whole, of which nearly half were immigrants. Not only were the officers leading men from diverse backgrounds that were incredibly different from their own, they were by and large drawn from white-collar professions and college students, and thus very inexperienced in matters of the military and war. This further strengthened the convictions of Abbott and his fellow officers to prove themselves as capable soldiers. According to officer handbooks such as August Kautz’s Customs of Service for Officers of the Army, the most important quality for a young, inexperienced officer to possess was courage. This guide implicitly stated that a man “cannot have his courage questioned and expect to succeed as an officer.” The truest test of courage was considered to be bravery in battle, and soon after joining the regiment, Abbott began to express in his letters the desire to prove himself in combat. The first time a soldier saw battle was often marked by fear, not necessarily of death or bodily harm, but of being revealed as a coward. Courage had a very narrow definition for Civil War soldiers, being simply “heroic action undertaken without fear.” Furthermore, courage had to be tested and proven. Since most regiments were raised locally, close ties to soldiers’ home communities within their regiment further increased pressure to be brave. Ball’s Bluff also marked Abbott’s first exposure to both defeat and death on the battlefield. Abbott largely ignored the sight of casualties of the battle in his letters, instead focusing on the bravery of the men and the worthiness of the Union cause. After this battle, Abbott’s letters were still very buoyant and patriotic, and could even be described as a bit blustering. Most of his letters concentrated on recounting the infallible courage of his men. At this point, Abbott was already establishing close ties to his regiment, particularly the men in his company. In a letter to his father, he described his men as “the best set of [men] that could be…desired,” and admitted that his attachment to them sometimes prevented him from disciplining them in the same way as he did at the beginning of the war. He also refused a promotion to captain, despite his own very powerful ambitions to rise in rank, because the change in position would also require him to leave his company for another. His letters to his parents also indicated transformations in his attitude about war in general. Correspondence with his father was of a much more political and military nature, and he seemed to be embracing his role as a soldier. A few days before Ball’s Bluff, Abbott wrote, “I have lost all ambition, for the present, for any thing but the military. I am now completely absorbed in that, & have no interest for any thing else.” Abbott’s fairly positive and hopeful view of the war was destroyed when the death that came along with battle affected him on a personal level. The aftermath of the battle of Cedar Mountain left Henry Abbott with a very different experience with death than Ball’s Bluff, and this experience would shake his convictions to their core. Although Abbott did not participate in this battle personally, it can be argued that the fighting of August 9, 1862 was the most transformative of his military career. I have had a good many letters about Ned but I can’t answer them. To think of the subject unmans me. I have to keep it from my thoughts. Ever since the news came, the regiment has been in the most trying circumstances where it was absolutely necessary to force cheerfulness before the men as well as the officers. A man who didn’t would have been a coward & false to his trust. I know I haven’t allowed my feelings to interfere with my duties. Abbott felt openly grieving for his brother in the presence of his men would undermine his own masculinity, and possibly cause him to be viewed as cowardly and weak in the eyes of the regiment. Officers from the elite saw manhood as being synonymous with self-restraint and emotional coolness, and if Henry Abbott had come undone over the death of his brother, he felt his reputation as a courageous officer would have been compromised. The second factor that prevented Abbott from openly grieving was how the Civil War complicated the “elaborate cult of death” elite Victorian Americans had created for themselves. Americans at this time were much more acquainted with death than their modern counterparts, but the Civil War changed who died when, where, and under what circumstances. The widespread death that occurred during the war was not considered “ordinary death,” despite becoming the most widely shared war experience. The pre-war culture had many assumptions about how death should occur, and these assumptions did not cease with the onset of war. According to the widely prevalent concept of the “Good Death,” a person’s last moments were supposed to be “witnessed, scrutinized, interpreted, narrated,” and prepared for, ideally by their family and loved ones; this was impossible for those dying in battle or in field hospitals. Death at this time was very connected to the home, and family played an integral role. Therefore, it was highly distressing that so many soldiers were dying away from their homes. This fixation with bearing witness to a loved one’s death can be seen in Abbott’s letters. Many times, soldiers attempted to find substitutes for the missing pieces of their rituals, hoping to prove that their loved ones “died well.” Henry Abbott was no exception to this phenomenon. One substitute Abbott found was by openly expressing his grief for other soldiers in his regiment who were killed in battle. Outwardly mourning for a dead comrade was an appropriate form of masculine sentimentality, because it fit with the idea of the “heroic martyr” common at the time. Although Ned certainly fit into the mold of a martyr’s death, and could be easily mourned in that way by his family, Abbott felt uncomfortable expressing grief in this way because Ned fought with a different regiment. With the deaths of men from the 20th Massachusetts, the entire fighting unit shared in the grief, and it was acceptable to express that sorrow in an open and honest way. Through this grieving process, Abbott began to think of his company not as a band of comrades he was very fond of, but a surrogate family. He habitually referred to the men killed by using very fraternal terms, and often compared their loss to the loss of his own brother. This was made easier by the fact that Civil War soldiers did not make a complete transition from civilian to military life; the fact that so many of these soldiers came from the same area meant that it was easy for them to see their fighting units as an “extension” of their communities. One example of this surrogacy was Abbott’s reaction to the death of Second Lt. Leander Alley, who was killed at the battle of Fredericksburg on December 11, 1862. When describing the death of this man to his father, Abbott stated, “You will know how I feel about his loss when I tell you that for a moment I felt the same pang as when I first heard of our great loss. I don’t want to say any thing more about him now, for thinking on such a subject makes a man bluer than he ought to be in the presence of the enemy…” Abbott very clearly compared the loss of Alley to the loss of his brother by referring to “our great loss.” Although he indicated a concern with expressing his grief too openly, he qualifies this by adding that his concern was with expressing grief in front of the enemy, not in the presence of his men. Abbott also seemed to be more conscious of his own mortality. In a January 19, 1863 letter to his father, Abbott indicated that he expected another large and costly battle to occur soon, and closed the letter by writing, “If I don’t have the luck to come back with the army, good bye to you and all the rest…” admitting that he wanted “to take advantage of the last chance I possibly may have to say good bye to you and all.” In this same letter, Abbott also dictated that upon his death, his earnings should go to a fund established in order to help the families of those soldiers in his company who were killed or disabled. In antebellum culture, a considerable amount of emphasis was placed on the last moments of life and particularly “the life-defining last words.” Those at home were often eager for messages from their dying loved ones, and it is possible that Henry Abbott was attempting to prevent his parents from having to bury another son without any idea of what his pivotal last moments comprised. This letter exhibits the care Abbott took to provide substitutes for a “good death” for his parents, as well as his concern for his surrogate fighting family upon his demise. During the summer of 1863, Abbott continued writing emotionally charged letters to his family and the families of soldiers killed. Abbott described the death of Henry Ropes at the battle of Gettysburg to his father, writing, “Poor Henry Ropes was one of the dearest friends I ever had or expected to have. He was one of the purest-minded, noblest, most generous men I ever knew. His loss is terrible.” In a letter to Ropes’ father, Abbott also illustrated how grief was able to be openly expressed amongst the fighting unit, stating that “His men actually wept when they showed me his body, ever under the tremendous cannonade.” The men felt comfortable enough to express their lamentations even during the heat of battle. In this letter, a pivotal difference can also be seen in how Abbott personally dealt with Ropes’ death in comparison with Ned’s. Instead of pushing grief for Ropes from his mind, Abbott admits that he “can’t cease to think of him.” Abbott also expressed similar sentiments to his close friend and fellow soldier, Oliver Wendell Holmes, Jr., when he wrote to Holmes, “Henry Ropes’ loss I felt as I should a brother.” Abbott was not only openly exhibiting these strong emotions with his family and the families of those killed, but with his fellow survivors. In the Fall of 1863, Abbott truly emerged not only a good and valued officer, but an influential role model for other soldiers in the 20th Massachusetts. Abbott was rising in the ranks, having been promoted to major in October of 1863, and was occasionally in temporary control of the regiment. One of the longest serving officers in the 20th Massachusetts, despite only being twenty-one years of age, he was looked upon as an example to less experienced officers. The most extreme transformation in Abbott’s ideals was his personal view on war. In a September 1863 letter to his mother, he described himself as being “naturally of a warlike & ferocious, & not of a domestic turn,” a direct contrast to how he saw himself at the beginning of the war. Abbott’s feelings about his comrades had fully transitioned from fighting unit to pseudo-familial unit. He expressed the deep feelings he had for his fellow soldiers in this letter to his father: “Before the war, one could scarcely feel the same for a companion, untried as those friends since made have been by the scorching ordeal of this war, which discloses all the noblest qualities of the noblest men.” Even when given the opportunity for great personal gain, Abbott refused to leave his comrades; he refused both an offer to advance to lieutenant colonel of another regiment, and an offer of leave to see his family. It was possible that Abbott and the 20th Massachusetts were experiencing the phenomenon of “small-unit” or “primary group” cohesion. This was the bond soldiers formed with those closest to them, particularly with their companies and regiments, and the dependence they had on their fellow soldiers in order to fight. The members of the primary group were thought of as “brothers,” often referred to as such, and the unit itself served the purpose of a surrogate family. There was nothing short of love amongst veterans who fought together for extended periods of time, and leaving the unit would be the same as leaving family. Loyalty to members of the primary group did not end with the end of life; to leave or betray the primary group would be the same as dishonoring the dead. This cohesion extended far beyond the battlefield, and the close bond of Abbott’s surrogate family allowed him to create a space where he felt comfortable openly expressing his emotions away from his home. Abbott’s usage of surrogates in his grief for his brother culminated in September of 1863, upon his visit to the Cedar Mountain battlefield. Significant preparation went into this visit, and Abbott made sure he was accompanied by a guide, so as to stand as close as possible to the location of his brother’s death. After his visit to Cedar Mountian, he sent a descriptive letter to his parents detailing how he imagined his brother’s final moments. He wrote that “Ned advances through the field, where he is met by a heavy fire from the front and the bushes on his right, driving him back with tremendous loss, & it is back on the edge of the wood that he is at last hit.” He then openly expressed anger and frustration with Ned’s death, writing, “When I look at the place, I think he was murdered…” Abbott was fixated on the idea of seeing the spot where Ned was killed, the closest he would be able to come to witnessing his brother’s last moments. By sharing this experience with his parents, the Abbott family found the best means for giving Ned a “good death” given the situation. This was only possible because Abbott felt comfortable enough with his surrogate family, his fighting unit, to visit the old battlefield and face his grief. May 6, 1864 was Henry’s Abbott’s little brother Frank’s twelfth birthday. It was also the last day of Henry Abbott’s life. During the ferocious battle of the Wilderness, the 20th Massachusetts once again found themselves in the thick of the worst fighting. As the Harvard Regiment headed directly into the fray at the Brock Road-Plank Road intersection, Henry Livermore Abbott was spotted by Colonel Theodore Lyman, of Meade’s staff. Lyman recounted the impression the young major made in the following way: “Abbot smiled and waved his sword towards me, as he rode by, and I called out to him wishing him good luck.” The sight of Abbott cheerfully leading his men into battle would remain with Lyman for the rest of his life, and he would forever remember him as “a man who could ride into the fight with a smile on his face.” Moments before his death, Henry Abbott was described as the epitome of the cool, restrained man. Becky Oakes, a graduate of Gettysburg College, is currently finishing her master’s degree in 19th-century U.S. History and Public History at West Virginia University. Becky’s research focuses on Civil War memory and cultural heritage tourism, specifically the development of built commemorative environments. She also studies National Park Service history, and has worked at Fredericksburg & Spotsylvania National Military Park, Gettysburg National Military Park, and the Civil War Institute at Gettysburg College. Abbott, Henry Livermore. Fallen Leaves: The Civil War Letters of Major Henry Livermore Abbott. Edited by Robert Garth Scott. Kent, OH: The Kent State University Press, 1991. Carnes, Mark C., and Clyde Griffen. Meanings for Manhood: Constructions of Masculinity in Victorian America: Chicago: The University of Chicago Press, 1990. Carroll, Bret E. “‘A Higher Power to Feel’: Spiritualism, Grief, and Victorian Manhood.” Men and Masculinities (2000): 3-29. Faust, Drew Gilpin. This Republic of Suffering: Death and the American Civil War. New York: Vintage Books, 2008. Foote, Lorien. The Gentleman and the Roughs: Manhood, Honor, and Violence in the Union Army. New York: New York University Press, 2010. Howe, Mark DeWolfe. Touched by Fire: Civil War Letters and Diary of Oliver Wendell Holmes, Jr., 1861-1864. New York : Fordham University Press, 2000. Kautz, August V. Customs of Service for Officers of the Army. Philadelphia: J.B. Lippincott & Co., 1866. Laderman, Gary. Sacred Remains: American Attitudes toward Death, 1799-1883. New Haven: Yale University Press, 1996. Linderman, Gerald F. Embattled Courage: The Experience of Combat in the American Civil War. New York: The Free Press, 1987. McPherson, James M. For Cause & Comrades: Why Men Fought in the Civil War. New York: Oxford University Press, 1997. Miller, Richard F. Harvard’s Civil War: A History of the Twentieth Massachusetts Volunteer Infantry. Hanover: University Press of New England, 2005. Mitchell, Reid. The Vacant Chair: The Northern Soldier Leaves Home. New York: Oxford University Press, 1993. Ropes, Henry. Civil War Letters of Henry Ropes: manuscript, 1859-1863.Boston Public Library, http://archive.org/details/civilwarletterso01rope. Rotundo, E. Anthony. American Manhood: Transformations in Masculinity from the Revolution to the Modern Era. New York: Basic Books, 1993. Scott, Sean A. 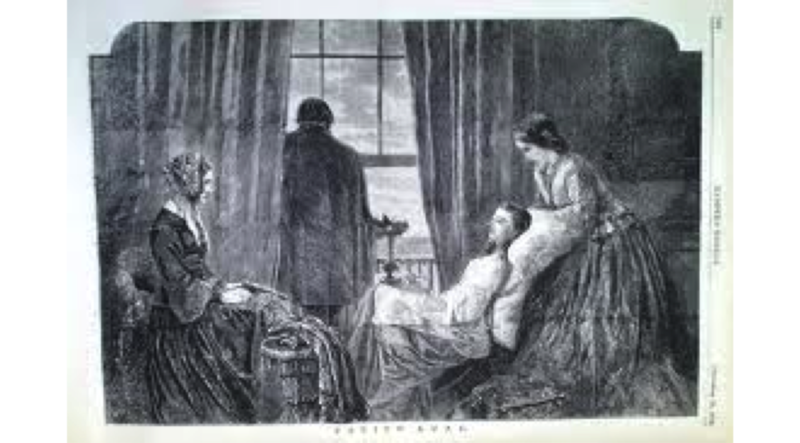 “Earth Has No Sorrow That Heaven Cannot Cure”: Northern Civilian Perspectives on Death and Eternity During the Civil War.” Journal of Social History (Summer 2008): 844-66. Shantz, Mark S. Awaiting the Heavenly Country: The Civil War and America’s Culture of Death. Ithaca, NY: Cornell University Press, 2008. Silber, Nina, and Sievens, Mary Beth, eds. Yankee Correspondence: Civil War Letters between New England Soldiers and the Home Front. Charlottesville, VA: The University Press of Virginia, 1996. The War of the Rebellion: A Compilation of the Official Records of the Union and Confederate Armies. Washington: Government Printing Office, 1888. Wiley, Bell Irvin. The Life of Billy Yank: The Common Soldier of the Union. Baton Rouge, LA: Louisiana State University Press, 1971.